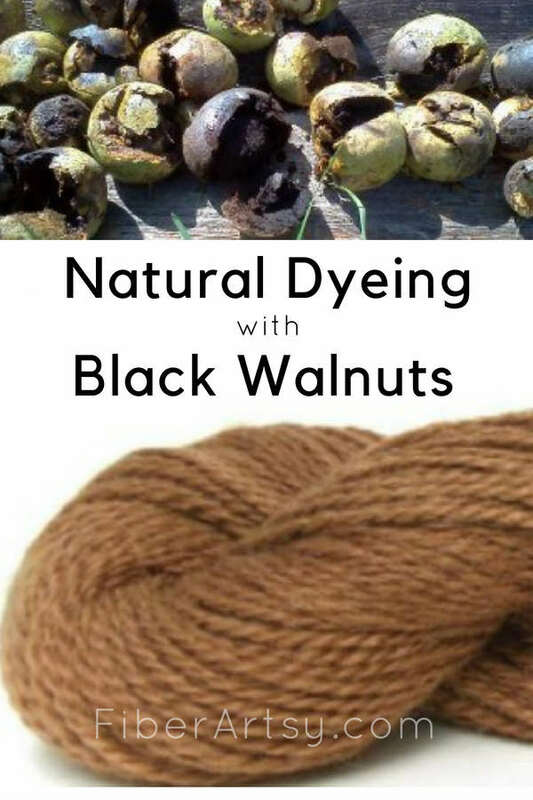 A few years ago, I shared with you my tutorial on how to naturally dye yarn with black walnuts. Well, it’s that time of year again, the black walnuts are dropping, so I thought I would update my yarn dyeing tutorial. I have learned a few more things about natural dyeing since then and wanted to pass that information on to you. Yep, it’s time to put the helmets on the alpacas again! 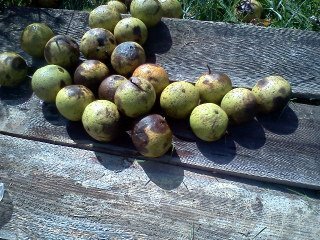 Those black walnuts crash down like little bombs. Much earlier than normal. The drought? Which reminded me of my natural dyeing experiment last fall. Here’s a recap ….. 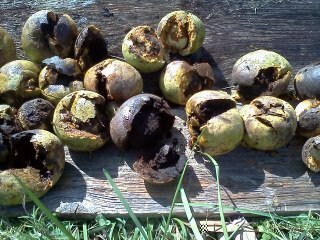 Since a billion black walnuts came crashing down this year I thought, maybe it’s time to try dyeing yarn with them. Walnuts are easy to use since they stain everything (EVERYTHING) and you don’t have to use a mordant to set the dye. First you put on old clothes and gloves since they stain EVERYTHING!! Next, using your hammer or rock, you want to smash the hulls to open them. It’s not necessary to crack the walnuts altho you can do that as well. 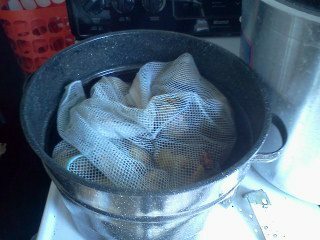 Put the nuts and hulls in a mesh bag, place in a pot of water and bring to a boil. Simmer this for about an hour, remove the mesh bag and let the dyebath cool. When I did this experiment the first time, I used about 20 black walnuts and dyed 6 skeins of yarn. That was WAY more dye than I needed! 6-8 walnuts should be plenty. Once the dyebath has cooled, I would strain the dye with either muslin or a coffee filter to remove as much of the debris as possible. This will make your yarn easier to rinse. Meanwhile, soak your yarn in hot water (vinegar is optional). Once the dyebath and the yarn water have cooled, add your yarn to the dyebath. Simmer for 30 minutes up to an hour. Let cool. Vinegar is not needed as a mordant. Black Walnut dye is very colorfast on its own. Then you have to rinse rinse rinse and rinse some more! Unbelievable the amount of dye left in the yarn! Makes a beautiful, warm deep brown. The color will be much darker and deeper if you use the nuts without the hulls. Hang your freshly dyed yarn to dry. The leftover dyebath can be reused again and again, as long as there is still color in the liquid. The subsequent dyes will be lighter in color but should produce a lovely, soft and warm brown just the same. 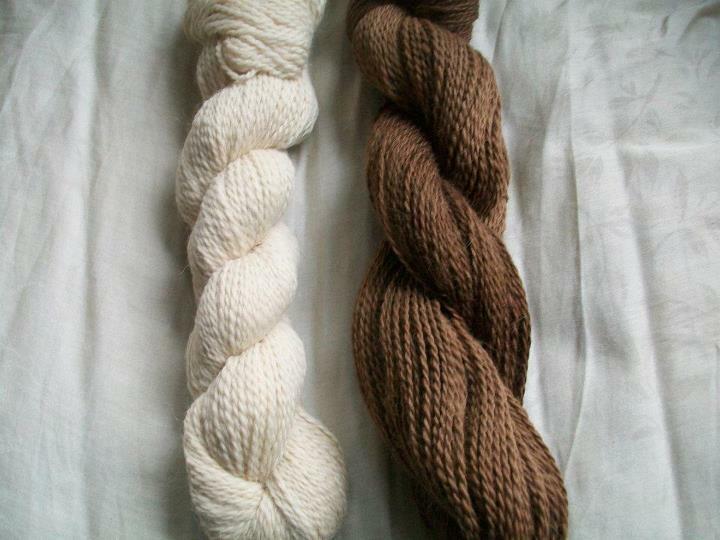 Have fun experimenting with dyeing your yarn! If anything is unclear or you need more information, please feel free to ask.